When I read Matched by Ally Condie, I just couldn't put it down. Crossed picks up right where Matched left off, and I read it swiftly, despite a busy schedule. Condie switched up her tactic as far as the perspective of the story was concerned, and at first I was surprised by that, but I really liked it quite well. There are new characters, the ever-threatening presence of the Society, and new secrets that are revealed. Though the story moves slowly, I find it very well written and captivating. The relationship between Ky and Cassia continues to grow while Cassia simultaneously struggles with the fact that she is still Matched to Xander, who takes a backseat in this book, but is still omnipresent. The perspective of the book toggles between Ky and Cassia, much like The Game Thrones series introduces new perspectives in this way. It basically bats back and fourth between the two as the pair journey toward one another and presumably toward the Rising that they are trying to find. There are a ton of obstacles in front of the two of them, and in a world where the Society is always watching, there are tense moments that give way to big triumphs as well as unimaginable loss for the characters. We get a lot more information about Ky's backstory and he emerges as a stronger and even surprising character in many respects. I also really liked the two new characters: Eli (who is likened to Cassia's brother Bram) and Indie, an Aberration Cassia meets in the Outer provinces. They add a great deal to the story and allow us to see new sides of Cassia and Ky through the relationships that they have with Eli and Indie. Crossed sets a great stage for the new book, Reached, which comes out on November 13, 2012. I can't wait to continue the tale of Ky, Cassia, and Xander and see where they all end up. This is another great series that I found I sunk my teeth into. 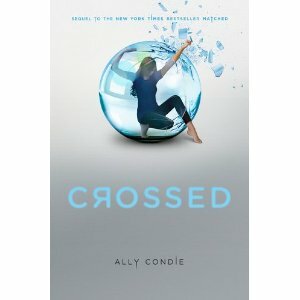 I just can't resist a great story with a futuristic twist and Ally Condie just does it beautifully! I loved the entire series. I've been reading these dystopias with my teenage daughters and have found them very enjoyable.